Keeping our children and youth safe is essential to their healthy development. Strengthening families so we prevent child abuse and neglect and acting quickly but thoughtfully to guarantee children have a safe, permanent, and loving home are key to ensuring every child can grow into a successful, independent adult. 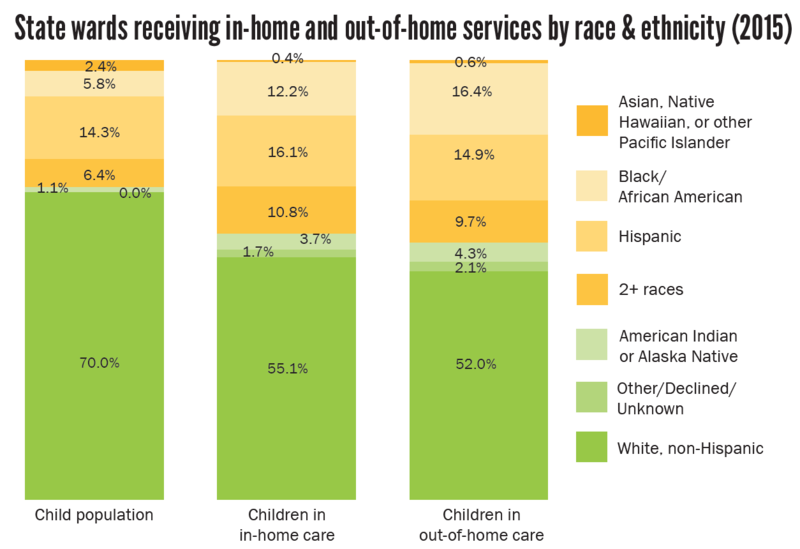 48.7% of children living in out-of-home care were living with relatives or kin. 220 emerging adults participated in the Bridge to Independence program. In Nebraska, the vast majority (83.7%) of maltreatment is physical neglect, which is a failure to meet a child’s basic needs like food, shelter, and clothing; this is, in many cases, an economic issue. Exposure to childhood abuse and neglect hinders children’s healthy social, emotional, and cognitive development. If untreated, toxic stress makes it more likely that children will adopt risky behaviors which negatively impact their future health and success. Given the impacts, we need to strengthen families to prevent abuse and neglect whenever possible, and take swift, thoughtful action to ensure that all children grow up in loving homes. of alleged maltreatment were made to the Child Abuse and Neglect Hotline in 2015. Do you know a child who is being maltreated? Call the Child Abuse & Neglect Hotline at 1-800-652-1999. Some children experienced more than one type of maltreatment. The numbers here will be higher than the total number of children who experienced maltreatment. It is important to note that only maltreatment cases that were reported are included in this report. The actual incidence of maltreatment may be higher than what is reported here. a decrease from 4,137 kids in 2014. Source: Department of Health and Human Services (DHHS). ; U.S. Census Bureau, American Community Survey 1-year estimates, Table S0901. In 2015, 4,945 children in 93 counties who were alleged victims of maltreatment were served by the Child Advocacy Centers (CACs) of Nebraska. CACs offer an innovative way of serving children who are victims of abuse through comprehensive strategies coordinating investigation and intervention services to create a child focused approach. Services include forensic interviewing, medical evaluations, advocacy and support, therapeutic intervention, case review, and tracking. The CACs ultimate goal is to ensure that children are not revictimized by the very system designed to protect them. Source: Nebraska Alliance of Child Advocacy Centers, 2015 Annual Statistics. 374 kids entering court designated care in 2015 had previously received non-court services. Children who are removed from their homes often experience traumatic and long-term consequences. Recently, DHHS has been seeking ways to keep families together while ensuring that safety can be maintained. This has been reflected in data from recent years in how families enter the system, with more and more families receiving services without judicial oversight (“non-court”) when appropriate. Non-court cases allow children to remain in their own homes, where they can continue to receive a stable source of love and care from their families. 5,322 kids entered the child welfare system in 2015. 3,020 (57%) were non-court-involved (the same as 57% in 2014). 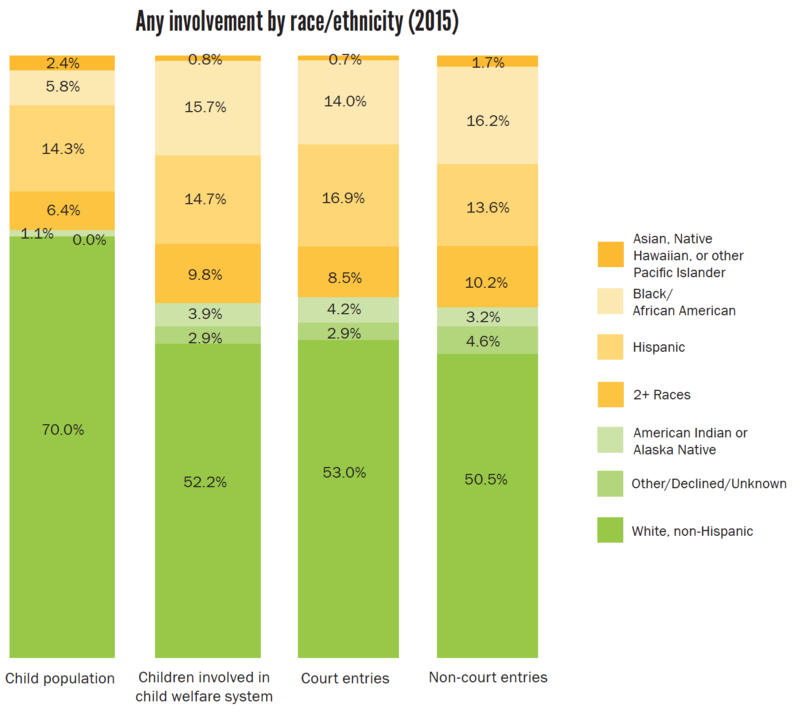 2,302 (43%) were court-involved (the same as 43% in 2014). 10,057 kids were involved in the child welfare system at some point in 2015. 6,681 (66%) from 3,680 families were court-involved. 3,376 (34%) from 1,357 families were non-court-involved. The Alternative Response (AR) pilot project was authorized by the Nebraska Legislature in 2014 after the state received federal approval to conduct the project as a part of a Title IV-E Demonstration Waiver. Historically, Nebraska only had one option for responding to allegations of child abuse and neglect—an investigation. The majority of children who come into Nebraska’s child welfare system are identified because their family is unable to meet their basic needs, which is often related to symptoms of poverty. 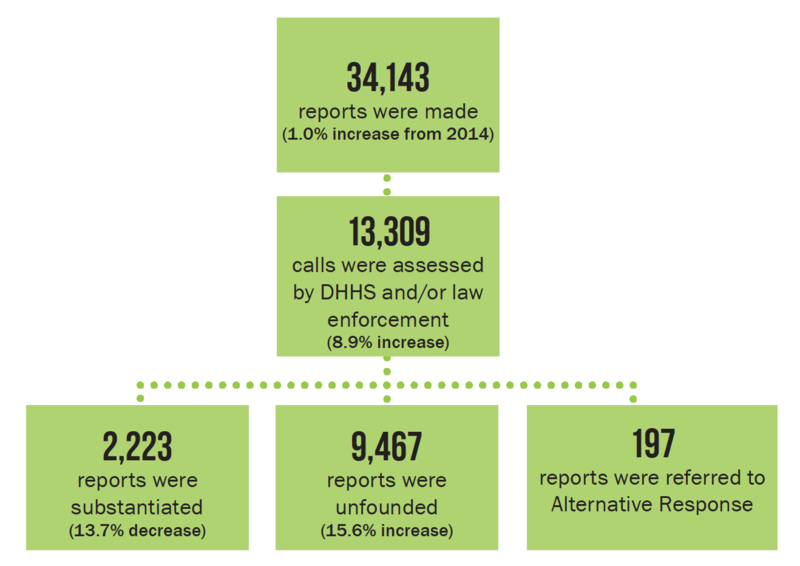 The pilot brought more flexibility to our state response to child maltreatment in certain low- or moderate-risk cases by allowing caseworkers to focus on harnessing the strengths of each family and building parental capacity through intensive supports and services. The pilot was implemented in staggered stages beginning in October 2014 and will be available statewide by July 2017, pending reauthorization by the Legislature. 13% of families served by Alternative Response (10/1/2014 – 6/30/2016) changed tracks to traditional response. 2,014 (35.5%) of children who were state-wards living in out-of-home care had a diagnosed disability. Sources: Nebraska Department of Health and Human Services (DHHS). ; U.S. Census Bureau, Population Estimates Program, July 1, 2015 estimates. *Point-In-Time, December 31 each year. Source: Nebraska Department of Health and Human Services. *Point-in-time data taken on December 31, 2015. When children must be removed from their homes, it is important to ensure that their placement reduces the trauma of removal and promotes the well-being of the child. Congregate care, which places children in an institutional setting such as a group home or detention center, should be used minimally for out-of-home placements. Research shows that placement in a familylike setting provides children with improved long-term outcomes in physical and emotional health. Although congregate care may be necessary for some children, for many others, it does not allow children to maintain the strong relationships with trusted adults that are essential for successful development. 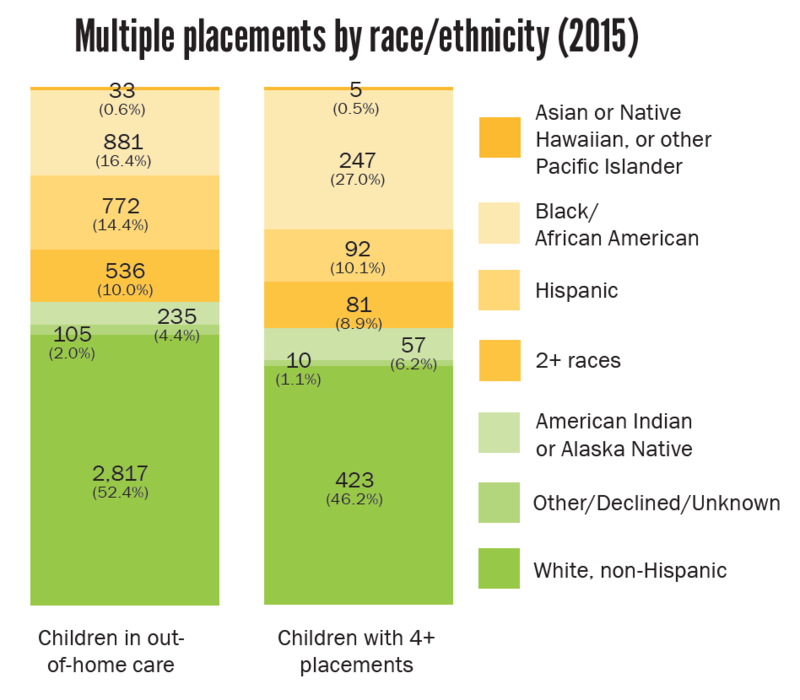 The Nebraska Department of Health and Human Services counts placement changes when, for example, a child moves from one foster care setting to another. Of the 1,717 children who exited out-of-home care in 2015, the mean length of time away from home was 21.5 months. Once in the child welfare system, children should be on a track toward achieving permanency in a safe, loving environment. Most of the time that means they will be reunified with their family and return home. Other times, permanency may be achieved through adoption or guardianship. 2,700 court involved children exited the system in 2015. 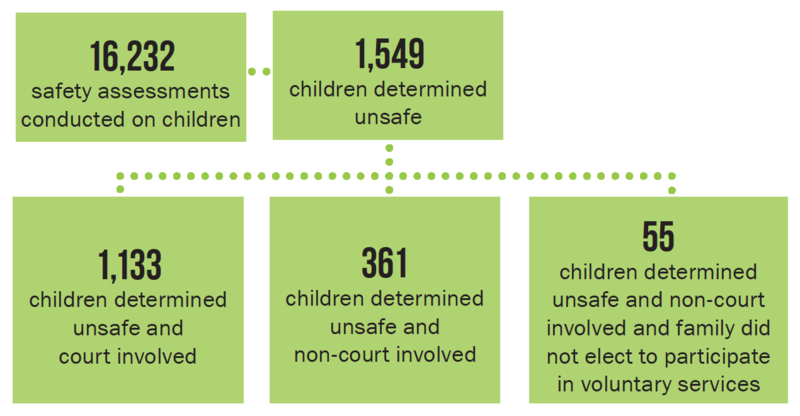 2,524 non-court involved children exited the system in 2015. *2013 and 2014 data variances are due to the transfer of youth from DCFS to Probation due to juvenile justice reform legislation. 136 of which were subsidized. 528 children were adopted in 2015. Mean time from becoming free for adoption to adoption: 9.6 months, a decrease from 10.2 months in 2014. 86 youth were in out-of-home care when they reached their 19th birthday in 2015. 220 emerging adults were served through the Bridge to Independence Program in 2015. 64 emerging adults left the program during this time. Family support is key to any successful transition into adulthood, especially for youth who may have been exposed to trauma. Learning to be self-reliant in seeking employment and housing, managing finances, or seeking healthcare can be daunting without family connections. For youth who have been in foster care who do not exit the system to a family, ensuring a strong system of support in this transition is key. To address this issue, the Unicameral passed LB 216 in 2013, which extended supports and services until the age of 21 for youth who have “aged out.” The Bridge to Independence (b2i) program began serving youth in October 2014. Participants must be either working, seeking work, or in school. In return, they receive Medicaid coverage, a monthly stipend to use for living expenses, and an assigned caseworker on call 24/7 to help them navigate the transition to adulthood. *A young adult may have more than one reason for Bridge to Independence participation.